When the temperatures drop, dogs need special care to stay healthy, safe, and warm. Whether your pup spends lots of time outdoors or goes out for a couple of quick walks, he needs your help to avoid cold-weather health hazards. Keep a few basic tips in mind this winter. Watch out on walks: Snow and ice can take a toll on your dog’s paws. If he suddenly starts limping during a walk, check for ice between his toes, and soothe cracked or red paw pads with a little petroleum jelly. You can buy booties to protect pets’ paws from the cold and ice, but be sure that they fit well and that they don’t keep your dog from enjoying his time outdoors. Grab a sweater: Dogs with thick fur probably don’t need an extra layer when they head outside, but smaller breeds and those with short coats may be happier in a cozy sweater or coat. Don’t leave pets in the car: Just as your vehicle traps heat in the summer, it can stay cold on a winter day, making it feel like a refrigerator for your pup. Dogs left in a cold car for too long can freeze to death. Make your house the dog’s house: If your dog spends most of his time outside, you need to be careful when winter sets in, even if he has a doghouse. The best way to keep your pooch safe is to keep him inside with you. But if you must keep him outdoors, make sure he has a doghouse that’s dry, free of drafts, with a floor that’s off the ground, and a doorway covered with a flap to keep out wind and rain. But even with all that, bring him indoors when the temps fall below freezing. Keep chemicals away: Your car’s antifreeze tastes sweet to pets, but it can be deadly if they swallow it. So clean up any spills right away and keep containers of the chemical out of pets’ reach. Ice melt and salt can dry out the pads on your dog’s paws, which makes them more likely to get cracked and irritated. Wipe his paws clean after every walk. Give extra helpings: If your dog spends a lot of time exercising outside in the cold, he’ll burn more calories and may need a little extra food to help him refuel. Ask your vet if you should add a little more to his bowl in the colder months. It may help to give him several small meals throughout the day instead of one large one. Recheck his collar, tag, and chip: It’s easier for dogs to get lost in the winter than at other times of the year. If he gets away from you, piles of snow and ice can cover up the familiar scents he would normally use to find his way back home. So make sure his collar is secure, his tag information is up to date and, if he has a microchip, make sure the registration for that is current. FCVC vets are always happy to consult with you about your favorite pets winter weather needs. 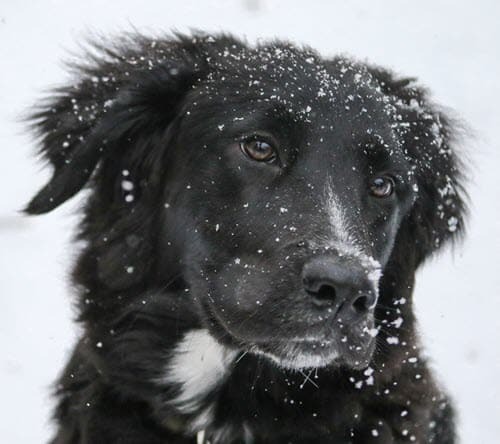 If you have concerns about your pets winter weather preparedness, please give us a call at 970-587-5140. You may find these articles of interest, too – Paws-ing to Check Your Pets Chip Day and Pets Need Dental Care, Too!